Welcome to Hillview Acres Campground! We are a family-owned, family-focused facility located in Cambridge, Ohio, just minutes from I-77. Our season runs from April 15 to October 31. 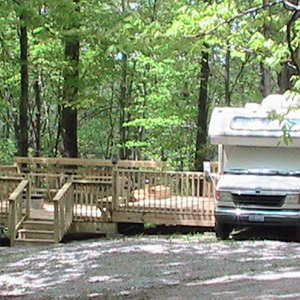 We offer 80 acres of shaded or sunny sites with water, electric, fire ring and picnic table for your RV camping experience. We work hard to provide you with all the amenities necessary to make your stay comfortable and relaxing! While you're here, stop by our well-stocked camp store, play a few games in the game room, catch (and release) a few fish in one of our two ponds, play with the kids on the playground, take a hike through nature, or just take it easy by your campfire. Complete your vacation with some of the surrounding sites and attractions, such as Salt Fork State Park, the Wilds conservation center, or one of the glass factories and museums our area offers. Because your vacation should include the whole family, pets are welcome! We only ask that you keep them leashed and keep the camp area cleaned up. We will do all we can to make your experience enjoyable. Please do your part as well by observing the campground rules that have been set up for everyone's safety and enjoyment. Call today to make a reservation, and get ready to sit back and unwind. We look forward to serving you!